Manx Basking Shark Watch | Hibernation? Until recently it was thought that basking sharks hibernate in the winter. There were two main reasons for this hypothesis. The first reason was that basking sharks apparently disappeared for most of the year. People normally see them in the late spring and summer. Sightings at other times of year are very much rarer. There has been one sighting of a basking shark off the west coast of the Isle of Man this February (2005) so winter sightings are not unknown, just rare. The second major reason for thinking that basking sharks hibernate was that some winter-caught basking sharks have shed their gill rakers. This obviously renders them incapable of filter feeding. This led to the general belief that basking sharks probably hibernate on the bottom in deep water whilst their rakers grow back and until the plankton levels came back to levels that made it worthwhile for them to feed. It was thought that they lived off the huge store of oil in their liver. A 4-ton basking shark may have a one ton liver, which is almost totally composed of stored oil. The winter hibernation theory was not unreasonable as the first spring sightings of basking sharks are normally near deep water and winter-caught basking sharks were caught in deep water. 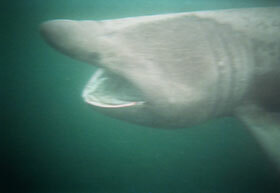 Basking sharks are sometimes found to be without gill rakers when they are caught in the winter. This, combined with the fact that they are not normally seen at the surface in winter lead to the theory that they hibernated on the sea bottom and didn’t feed in the winter. This shark was photographed off Niarbyl, the Isle of Man. Picture: Shane Stigant. A couple of studies by Drs Francis and Duffy in New Zealand and Dr Sims and his team in Plymouth, England, have laid the hibernation theory to rest. Drs Francis and Duffy were looking at incidental trawl-caught basking sharks caught in fishing nets off New Zealand. They found that 203 basking sharks were accidentally caught over a 13-year period. They found that many basking sharks were caught in winter, particularly on the West Coast of New Zealand. Although it was not possible to determine the exact depths that the fish were caught there was no doubt that some of the sharks were caught in midwater trawls. They concluded that hibernating sharks were unlikely to hover in midwater and that these sharks were not hibernating. The study by Dr Sims and his team showed that the basking sharks which were tagged off Plymouth did not hibernate but actually travelled huge horizontal distances of up to 3400 km, actively diving in all water depths from the surface down to 750m deep during summer, autumn and winter. This study clearly showed that the basking sharks were not lying on the bottom in the winter but were very actively tracking the areas with the highest quantity of plankton in order to feed there. As winter basking sharks have been shown to travel actively, to move to the areas with the highest plankton levels, and to be caught apparently actively swimming in midwater, the hibernation theory can be assumed to be disproved: basking sharks do NOT hibernate. It now seems more probable that basking sharks shed their gill rakers at irregular intervals in the winter in order to renew worn feeding apparatus rather than not needing them to feed because they are hibernating.